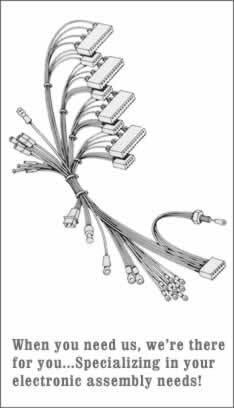 A wire harness is a group of wires that have been bundled together to transmit a signal or electrical power. Though often confused for cable assemblies, wire harnesses serve their own unique purpose. Both carry electricity, but wires are made up of strands of conductive material and are used for applications beyond transmitting electricity. Cables are made up of wires and an insulation material and tend to be better protected than wires. For more than 55 years, Omega Leads has specialized in the design and manufacture of custom wire harnesses and wire harness assemblies. As a leading wire harness manufacturer, we can provide complete solutions for a wide range of applications. From automobile wiring harnesses to the aftermarket wire harness assemblies required by all industries, we can do it all. Request a quote or contact us for the wire harnesses and wire harness assemblies you need. No matter what your requirements or application, Omega Leads can manufacture a wire harness that will surpass all your expectations. Omega Leads can create custom wire harnesses in any configuration you require. There are essentially no limits to our manufacturing capabilities. We build your wire harnesses based on your completed designs, or our in-house application engineering team can work with you to turn your unfinished designs into fully-functional wire harnesses that meet your exact requirements. Every custom wire harness is electrically tested to ensure proper performance. Omega Leads’ application engineers are here to answer any questions you may have and to help you conquer any design challenges you may be facing. We can work with your design and recommend adjustments if needed. We can create prototypes and first articles, allowing you to test your designs for form, fit, and function before a production order is placed. Because we offer complete turnkey solutions, your staff is free to concentrate on other important projects while we handle the entire wire harness manufacturing process. Once your final design is approved and your purchase order has been received, we will take your project from start to finish, with quick turnarounds to meet your schedule. All of our custom wire harnesses are built to IPC/WHMA-A-620 quality standards. We can add wire identification to identify individual leads for ease of manufacturing at your facility and for installers in the field. We can also add date codes and serial numbers for traceability. All Omega Leads products are made in the USA. From the simple to the complex, we can manufacture wire harness assemblies for any application. Contact Omega Leads to get our team started on the wire harnesses your project requires.